Not until 1834 was an effort made to build a church in East Liverpool though meetings were held in the log school house and the later brick one on the present site of the Fourth Street Common School, when inclement and cold weather prevented outside services. In that year the Episcopal congregation, just organized, put up a frame structure on Fourth Street on the same site now similarly utilized which was contributed by James Penderton, John Moore and Thomas Fawcett, the town's second owners. It was designated as St. Stephen's Protestant Episcopal Church. The first sermon preached in it was by the Rev. Thomas Mitchell, who became the initial rector. He was followed by the Revs. Thomas Adderly, James Goodwin, Edmund Christian, Mr. Butler, T. K. Rodgers, T. K. Coleman, Mr. McKay, Mr. Gilbert, Phillip McKim, Mr. Burke, Jesse C. Taylor, Frederick Williams and Rev. Mr. O'Meara. This is from a picture that was taken from the West Virginia side of the Ohio River in 1876. This can be a bit of a challenge. 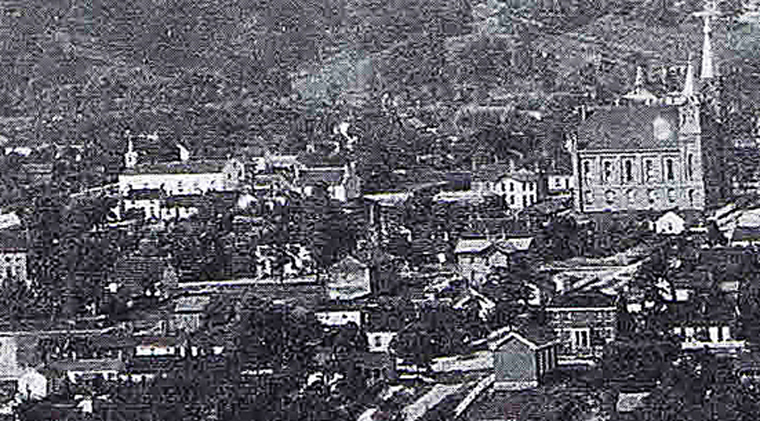 The large church on the upper right hand corner is located on the corner of Jackson and fifth Street, or modern-day Jackson Street and Jackson St. If you let your eyes drop down and moved to the left you'll see a small building that even looks like it has a steeple however in the picture above you you can't see a steeple. So perhaps this particular building isn't the right one. However the church should be in that general area. Part of the problem is there are several clumps of trees blocking the view. 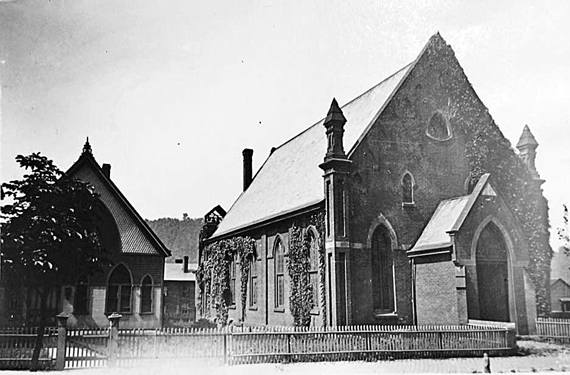 In 1879 on an adjoining lot the original church was replaced by what was known as "The Bell Church." The membership then was about 30, the attendance 150 and the Sunday School 125. The new structure, of brick, cost $6,000. It was destroyed by fire in 1899. Timothy Brookes This is one of the photos taken by Alfred Shone, an English potter immigrant who was an amateur photographer in EL prior to his death on 14 October 1905! The photo shows St. Stephen's Episcopal Church on Fourth Street in the same location as the present structure. This building, also known as "The Bell Church" was built in 1879 and was destroyed by fire on January 28, 1900. The building to the right and behind the church ruins is Third Street School. This is from an 1898 photograph taken from the West Virginia side of the Ohio River. Again using the church at the upper far right you let your eyes drop down little to the left you can see the Lutheran Church on Third Street. She let your eyes you move your eyes upward into the left count three rooftops ills you will be on top of St. Stephen's Church. A beautiful stone edifice replaced the lost church at a cost of $8,000 and was dedicated on Dec. 26, 1900, by Bishop W. A. Leonard, of Cleveland. In 1922-23 a commodious parish house was built between the church and the parsonage at a cost of $40,000. It was dedicated on Sept. 17, 1923 by Bishop Frank Du Moulen, of Cleveland, with Rev. Lionel C. Difford as the rector. As the lollowing pictures show houses with street addresses 208 204 and 200 are no longer there. Looking across Jackson street at the betginning of the 100 Block of West 4th Street. 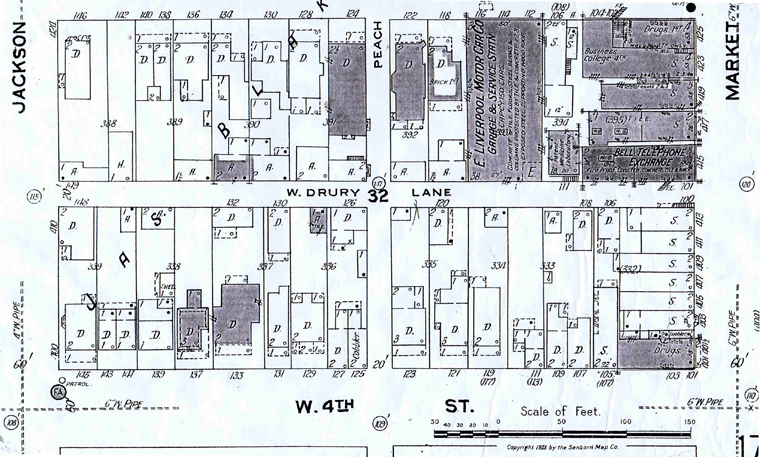 A 1923 Sanborn fire insurance map showing the north side of the street for the 100 block of W. 4th St. Corner house facing W. 4th St. and Jackson Street. The address would be 145 W. 4th St.